Coney Island Community College was the name of a ride on Coney Island that Fry attended in the 20th century. He later dropped out of the college and became a college dropout, a fact of which he is proud. The Mascot is the Coney Island Whitefish. The "college" is run by the Carnival Ride Operator. 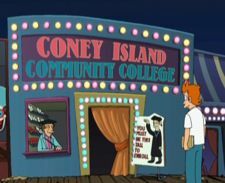 In the comic "New Year's Rockin' Evil", Coney Island Community College is not an attraction on Coney Island, but seems more like a legitimate institution, but is still a very low education institution as evidenced by its class selection, one of them being a lap dancing class. This page was last edited on 16 July 2010, at 19:00.